From time to time in Acctivate, a transaction for a product may post at one cost, then the cost may change later on. This article will explain some of the more common reasons for this. The most important thing to remember when troubleshooting why cost changed for a posted transaction is that cost is almost always calculated rolling forward by transaction date. In most cases, if cost is changed for a posted transaction, another transaction has been posted or modified on or before the date of the transaction which changed. For example, in the screenshot below, notice that product BB86 has only 1 cost establishing transaction posted on 4/3/17 in the F warehouse, a Receipt which added 100 to inventory at a cost of $7.45. BB86 uses Average Cost, so as this is the only cost establishing transaction, the Average Cost is simply $7.45 Ea. We then see that BB86 was sold on 8/2/17 and used that Average Cost of $7.45 Ea. Let’s say that someone forgot to post a receipt the week before, so they create the receipt and backdate it to 6/30/17. Let’s also assume that the Vendor that sells this product changed their prices, and you now purchase this product for $8.00 Ea instead of $7.45 as back in April. A new Receipt is posted which brings in 50 at a cost of $8.00. Since this changed the Average Cost of this product in the F warehouse as of 6/30/17, and cost calculates rolling forward, the cost of that Sale on 8/2/17 is recalculated to represent the new Average Cost as of the date of the Invoice, which now shows $7.63333. Backdated transactions are a very common reason why cost may be re-calculated on a posted transaction. 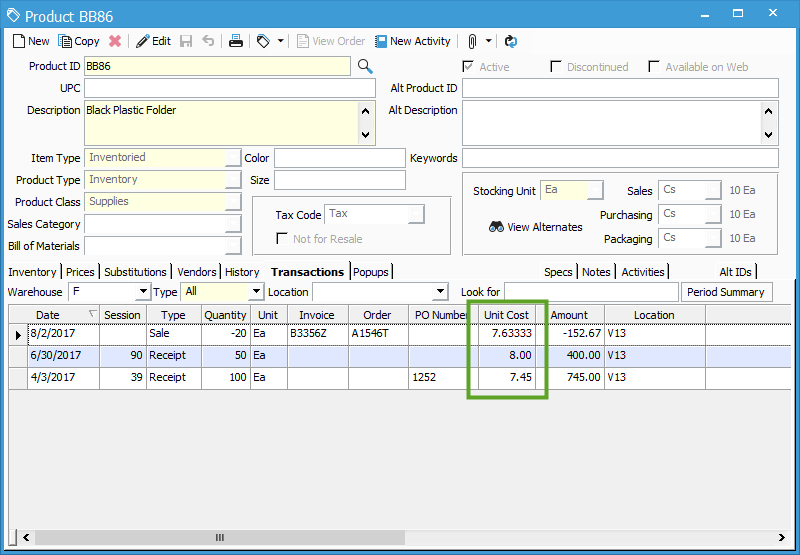 Another common cause for cost changing is posted Receipts which have not been Invoiced from the Purchase Order, and the Purchase Order specifies a different cost than the original Receipt. 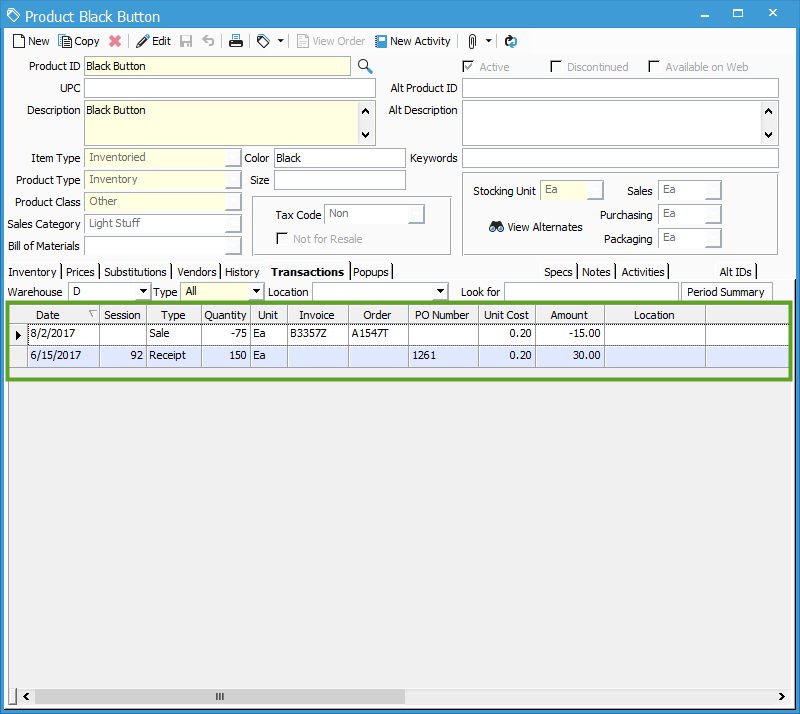 In the screenshot below, notice that 150 of the Black Button product was received on 6/15/17 at a cost of $0.20 Ea from PO 1261, then 75 were sold on 8/2/17 from order A1547T. Since the cost on the receipt was $0.20, that is the cost used on that Sale. Let’s say, for example, that you’ve been receiving goods in batches from PO 1261 and are just now ready to Invoice. At the time of Invoicing the PO, you find that the Vendor has changed the price at which you buy Black Button from $0.20 to $0.25. 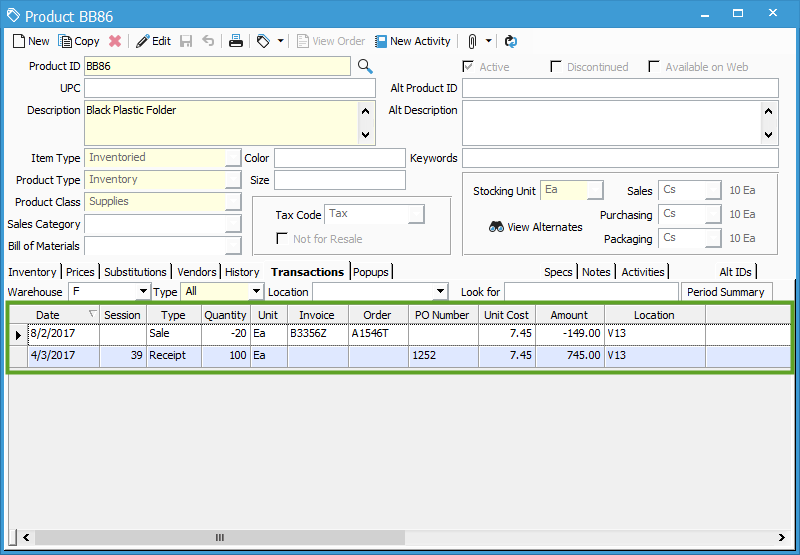 Since the Receipt must match the related PO Invoice, the cost on the posted Receipt is updated to $0.25, which is rolled forward, so cost is recalculated on the Sale. Selling products into the negative is another common reason why cost may be re-calculated on posted transactions. 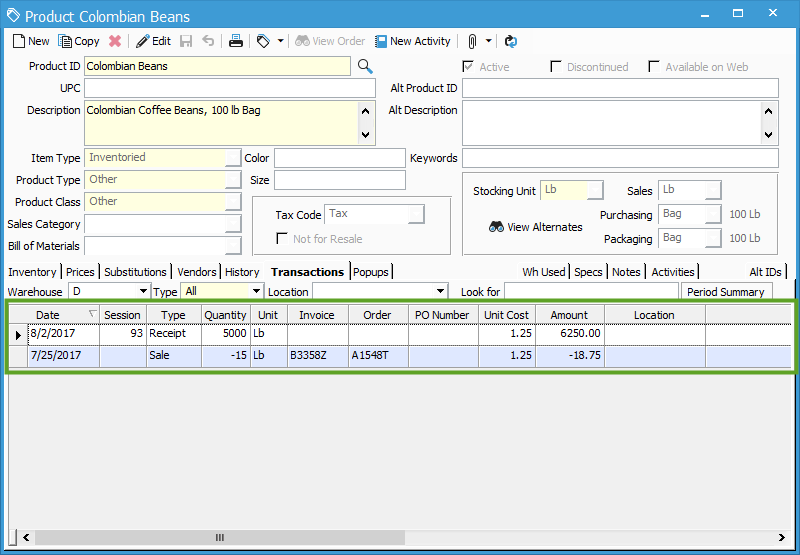 In the screenshot below, notice that the Colombian Beans product has only been sold from the D warehouse, so it’s been sold into the negative as of 7/25/17. As no cost establishing transactions have posted for this product in this warehouse, the Unit Cost on the Sale is $0.00. 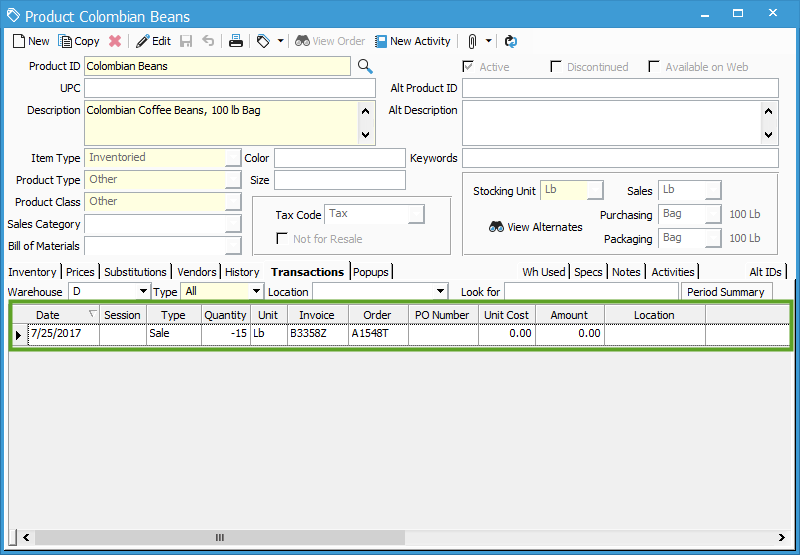 In this next screenshot, notice that a Receipt has posted as of 8/2/17 to add quantity and value to Colombian Beans. First, when attempting to post this Receipt, Acctivate suggests changing the posting date to 7/25/17 as that is the date the product was sold into the negative (see this article). If rejected, and the Receipt is not posted on the date suggested, Acctivate will still update the cost of the Sale which drove inventory into the negative. Assuming the Sale should not have been at $0.00 cost, Acctivate will set the cost of the new Receipt for the Sale. This is the only example of cost calculating backwards, and this will not be possible if the Sale is in a closed accounting period, but this is another reason why cost may be recalculated. As you can see, changes to cost for posted transactions are almost always a direct result of some other transaction which has posted or been changed since the transaction first posted. A good way to see if a transaction has been backdated is to check the session number. If a higher number appears somewhere related to an older date, it’s likely that transaction has been backdated. If you have concerns and are unable to figure out what may have caused cost to change for a given transaction, you can contact Support here.